Nice one. very like it! Excellent theme, i really like the background,and the color combination used in this theme, i will definitely use this in near future. great work on look and feel. I love this so much. Im going to use as my website template. Thanks alot! Nobody has made somethig as cewl as this! Super theme. Got it on the network blog. Very nice theme. I’ve inserted it in WordPressGala. 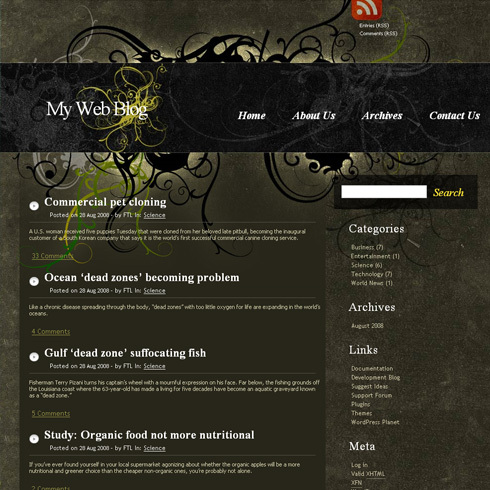 Very attractive theme with such a nice combination of colors…wanna apply on my blog. Never seen this kinda job before.Wonderful. Thanks for the great Theme – very COOL!!! Absolutely stunning. Would love to see a three column version, but this is exactly what I was looking for. Excellent work!